Here is a picture of Delimart Plaza in Delmas 32, Port-au-Prince, Haiti being looted during a protest over fuel price increase on July 7, 2018. On Friday, July 6, 2018, when the Haitian Commerce Ministry and Economic Ministry issued a joint statement announcing an increase of 38%, 47% and 51% price for gasoline, diesel, and kerosene respectively, it triggered days of violent civil unrest and demonstrations. Major protests erupted in the country with demonstrators using burning tires and barricades to block major streets across the capital and in the northern city of Cap-Haitien. Dozens of shops were looted and burned and cars were set ablaze. At least four people were killed. 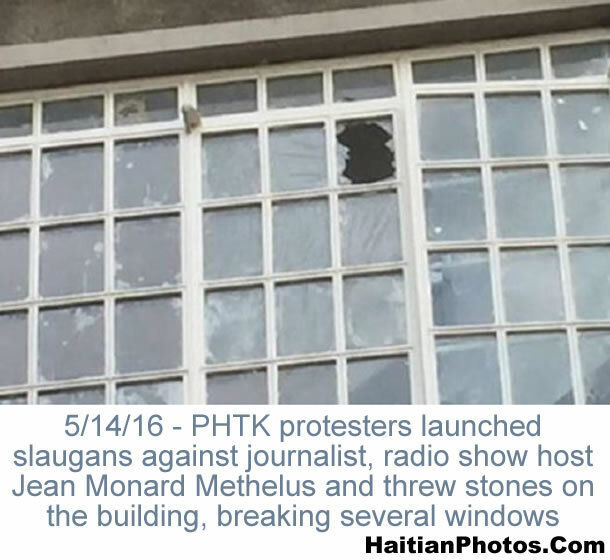 Western Premiere hotel in Petion-Ville was ransacked, banks and stores in Delmas were looted, and many flights were either cancelled or rescheduled. 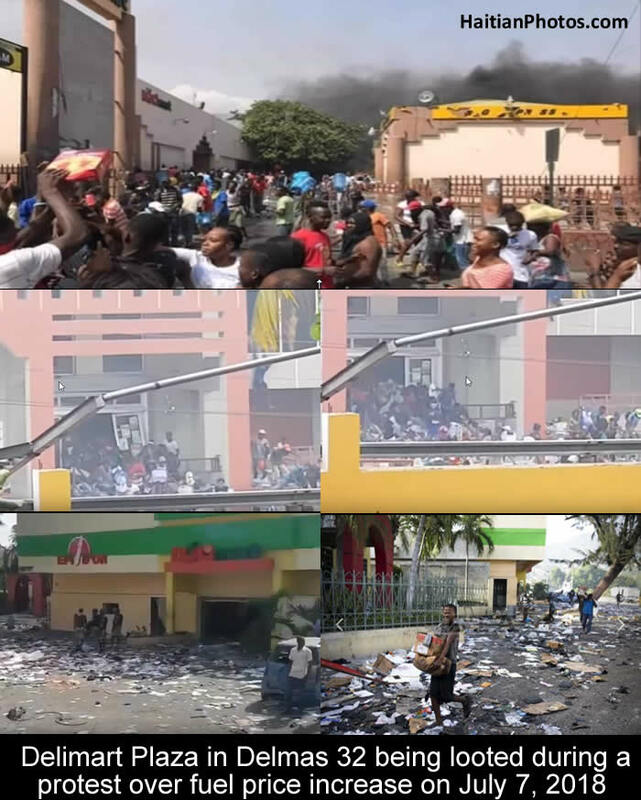 On Saturday, July 17, 2018, looters pillaged burned and vandalized Delimart Plaza. Delimart Plaza is one of the biggest supermarket chains in the capital city, Port-au-Prince. The superstore was founded by Dr. Reginald Boulos in 2000 who is a medical doctor and former chairman of Intercontinental S.A. Since its foundation the shop kept growing to become the biggest supermarket chain in the entire city. It the best place for quality goods at the lowest price, especially the one at Delmas 32, Delimart is comparable to any Publix or Walmart grocery stores in the U.S as far as the range of products and prices are concerned. However, unfortunately, this shop has been completely destroyed by the violent agitators. The local management is presently engaged in quantifying the damages, both in financial and human terms. 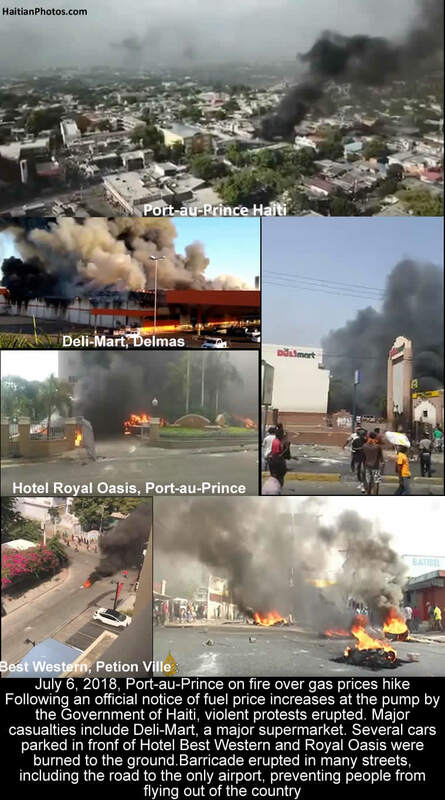 As per news dated, July 11, 2018, the Delimart S.A has announced that their properties located in various locations in Haiti such as in Delmas 32, Delmas 30 and Clercine were looted and some burned. The management has decided to keep their shops closed until further notice. The Directorate General of Delimart is aware of the precarious and difficult situations that will arise due to this closure. This closure of the stores will severely and lastingly affect hundreds of direct and indirect jobs. The local suppliers will bear the brunt of the negative effects. Moreover, the entire national economy will suffer with the rise of the unemployment rate as about 673 people will lose jobs in the stores due to this indefinite closure. 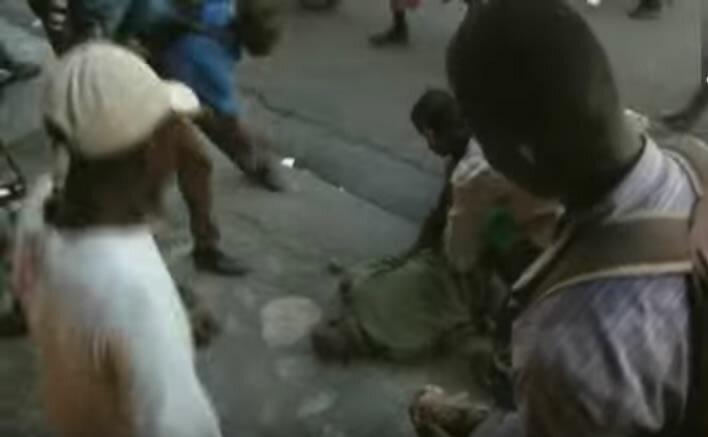 Here is a Haitian caught by the police during a protest against the election results. Most Haitians and opposition parties are of opinion that the presidential election of October 25th and its published result are a sure mark of treachery committed by the outgoing President Martelly and his men.  Regular protest against this "electoral coup d'état" on the streets has become a regular affair. 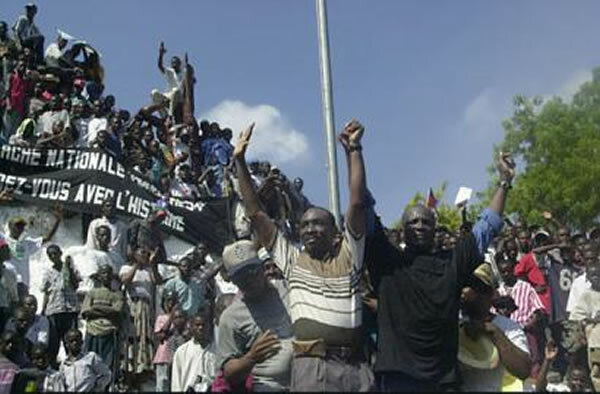 On one of such similar demonstrations of protest on November 20th, a gang of about 20 hooded men in a white pickup (license plate number 1-00692) armed with machetes, hammers, pipes and guns, attacked the marchers of several opposition parties in the Delmas 95 district. The police present on the spot turned a blind eye. A young man was shot dead and one marcher was wounded in the head by a machete. 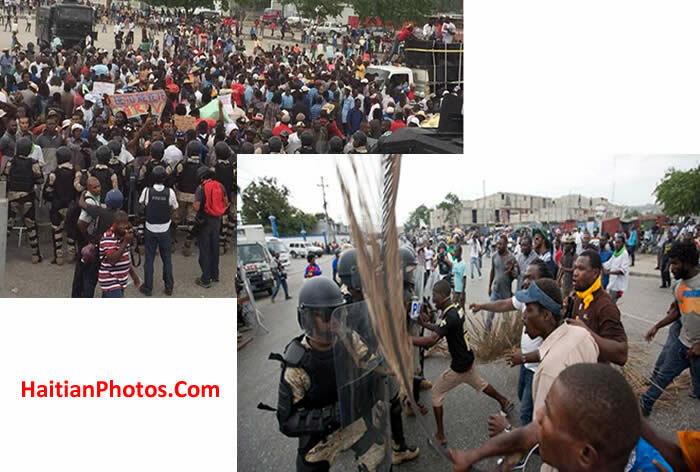 The Haitian police have arrested a demonstrator with machetes at the end of a march in Port-au-Prince. 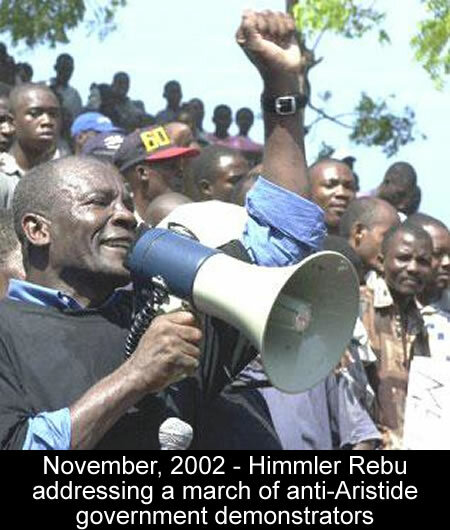 November, 2002, Himmler Rebu, an ex-Haitian Army colonel, of Haiti's National Progressive Democratic Party, addressing a march of anti-Aristide government demonstrators. Himmler Rebu is an ex-Haitian Army colonel in the leopard unit who jointly led the Platform of Haitian Patriots in the 2010-11 general elections with Dejean Balisaire and their party own 1 seat. Rebu led a coup attempt in 1989 against a provisional military government, and since then he kept a low profile until he was resurfaced again on November 17, 2002. On that day, he was seen addressing in a march of 15,000 anti-government demonstrators along with Evans Paul demanding Aristide's exit. Rebu told his audience to "Rise up." He said, he cannot maintain his silence because Aristide is ruining the country. 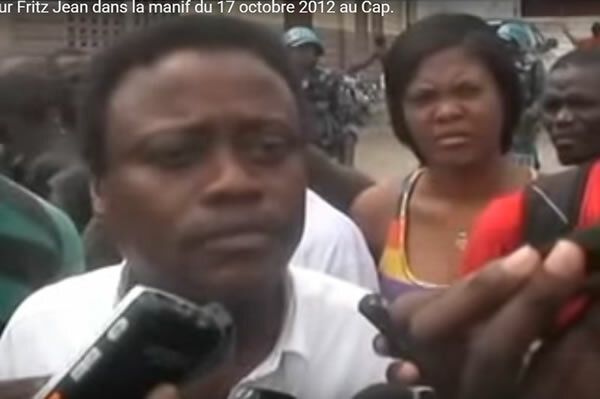 He also accused then Haitian President Jean-Bertrand Aristide behind the assassination of Haitian journalists Jean Dominique and Brignol Lindor at an anti-government rally in Cap-Haitien. Rebu claims that he has always been against any disorder irrespective of the nature of the chaos, whether it is in intellectual, political or in tactical field. Have you ever wondered why people in Haiti start their protest march the way they do? 'Damballah' is one of the most important of all the loa, the father of all the rest of the loa and the oldest of the voodoo pantheon existing from the beginning of time. It is the 'great master', creator of life that rules mind, wisdom and cosmic equilibrium and often called the most important god of the voodoo. Voodoo is the predominant religion of Haiti. The spirits are central to the practice of voodoo. This religion is a mixture of religions from Africa and Catholicism. Many Christian beliefs, traditions and figures have been incorporated into voodoo. 'Damballah' is the source of peace and tranquility. In Haiti, Damballah is known to be a very wise and pure lwa (or Loa, the spirits of Haitian Voodoo). Ayida-Weddo, the rainbow, is the wife, perfect mate and regular companion of Damballah. 'Their combined presence has the ability to calm the crowds, relax the senses and bring positive changes. 'Damballah Wedo', is represented by a snake or serpent; when it possesses a human, the person cannot speak but only hisses and whistles. Damballa is protective, wise, benevolent and loving. Aida-Wedo, the Lwa of rainbows, or the rainbow serpent is the symbol of integration. 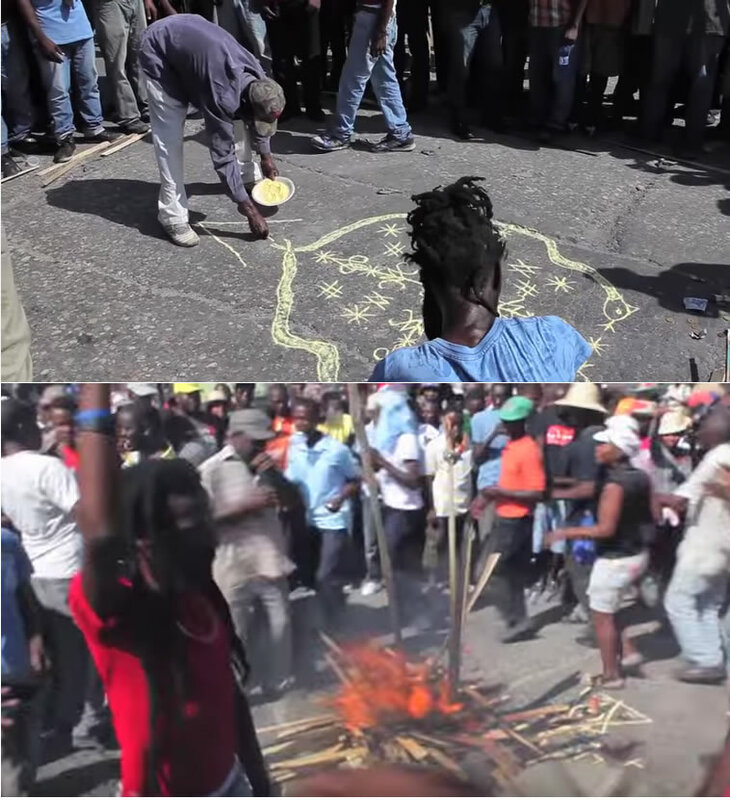 In Haiti, protest usually begins with Damballah Wedo' symbol. Firstly, someone from the protesting crowd draws the voodoo symbol of "Damballah-Wedo" in the middle of the street, then a campfire is set at the center of the sign and the protesters participate in song while turning around the fire. Damballah with superhuman power possess the ability to tap and manipulate certain occult energies; can bestow power to his mortal followers.